My book/workbook is finally here! Recent advances in neuroscience have shown that our brains are much more adaptable than we once believed. 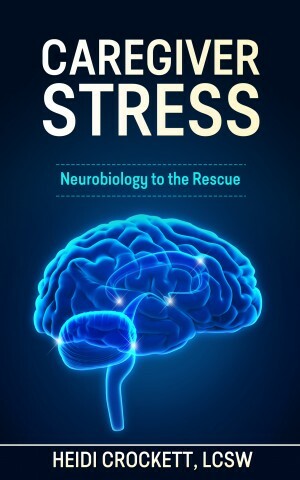 Caregiver Stress: Neurobiology to the Rescue explains in easily accessible language how we can use our mind to reshape our brain to better handle stress. Through self-reflection guided by a series of engaging questions and clearly explained neurobiological principles, the reader will build up a toolbox of skills and strategies to overcome the chronic stress a caregiver experiences 24/7. Author Heidi Crockett weaves together her personal experience of grief, professional skills as a counselor, and her in-depth knowledge of neurobiology to provide an overview of our responses to grief and caregiving stress. Most of all, through shared experience, this book tells us we are not alone, that what we are experiencing can be overcome, and that we can regain control of our own minds and make it through the stressful times. The wisdom in these pages will greatly help caregivers as well as others under stress to cope with and overcome the challenges they face.